Those last four rockets got made during the week, and even sewn together to form the quilt centre. Woohoo!! I like how the colours play so nicely together. 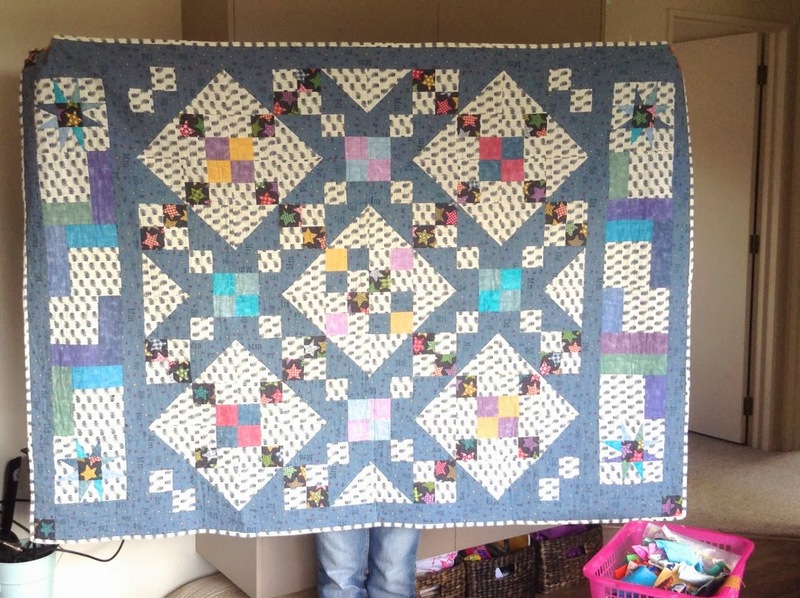 This was a mixture of remnants (bigger than scraps but leftovers from other projects) and small scraps for the star points, plus a light blue homespun background. After a discussion with my quilting buddies, it was agreed that I should use some of the black star fabric I purchased as the backing, and add it as a medium size border. I can always add a bit of variety to the back if it turns out I haven't quite got enough fabric for both areas. I have my fingers crossed... ever the optimist... but I'm really pretty sure that there won't be enough for both. Variety is a great thing! I have also been busy stitching down this binding on my secret project. I love this text print - and it makes an amazing binding! More on the secret project probably next month. Not much else happening on the quilting front. However, if you happen to read Ms Lotties blog (The Slightly Mad Quilt Lady)... you'll know that she has started recording quilt related pod casts. For those of you who like to listen, perhaps as you sew... it is a mighty fine was to multi-task - and learn a bit about what's going on around the world. This episode she bought her voice recorder to our once a month Saturday quilting group (this time at my place), and recorded as we discussed this and that. Then! She interviewed me! The evil woman! ... and a few other bits and pieces, tune in to her latest episode here. It's a great bit of fun. If you would like a bit more information... her show notes are on her blog post which is on my sidebar... or click here. Be sure to let me know if you have a listen - and let me know how terrible my accent is! Or if you would like more information about any of the things we discussed. You have been warned! Cool robot quilt! Cool quilting space. Ms Lottie takes a little time to get to the point......Didn't know if I'd last til your interview, and then it got really hard to hear! Then loud! But you do have a strong Kiwi accent! With a bit of an Aussie twang there too! Oooh! Haven't seen text print fabric - that looks great. I can think of so many ideas to use that for. Loving the robot quilt - really effective. xCathy. p.s. Giveaway at mine if you like. Ok so I am obviously way behind here so will have to spend some time 'seeing' what you and Ms Lottie have been up to!!! Shock! Horror! A Wednesday Update!